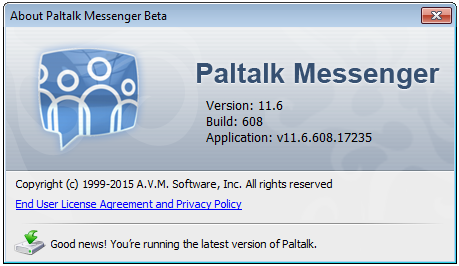 Paltalk 11.6 Build 608 Beta has been released. The previouse build was Paltalk 11.6 Build 606. I havnt had time to Test it. But hope you guys will test it out and If you encounter any Bugs or Issues then feel free to post it within Dutchplace Paltalk Bugs Forums, or you can also submit the bugs directly on Paltalk by visiting this link >> http://www.paltalk.com/bugs/ Thank you. Ps, Our Good friend and Forum Member AZE has decided to take a Break from Paltalk. He is the one who usually Publishes the new Paltalk Releases & Builds in the forums. We wish for his safe return.